There have been several conferences on photographic gelatin over the last 40 years and these have been organized, usually alternately, by the RPS and the IAG. The IAG was formed originally by gelatin manufacturers and users of photographic gelatin as a working group (Internationale Arbeitsgemeinschaft Photogelatine, IAG) to try improve our understanding of photographic gelatin. It could be said that this has been achieved to a large extent although the search for knowledge is never ending. However, the need for a conference that is dedicated almost exclusively to photographic gelatin has changed along with the changes in photographic technology, the introduction of digital imaging, and also the restructuring taking place within the gelatin and photographic industries. The new IAG, now known as IAGS (International Advanced Gelatin Science Society), aims to focus on all gelatin types and applications and this includes particularly the edible and pharmaceutical applications. This first conference of the new IAGS was directed by Dr P. Koepff, president IAGS, and the steering committee (Dr Alain Giraud/Rousselot, Dr Jos Olijve/Fuji Photo Film, Dr Yuzo Toda/Fuji Photo Film, Dr Erwin Quanten/PB Gelatins) and was dedicated to the memory of Professor Hans Ammann-Brass (15 June 1907 - 29 April 2002) who was the founder of the IAG and organized these conferences over many years. 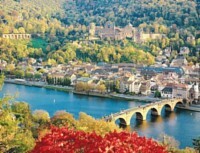 The present conference took place over the 3 days of 7-9 September in Germany in the historic university city of Heidelberg. The conference attracted 90 participants from around the world with some 36 presentations being given. Many papers covered pharmaceutical uses of gelatin in hard and soft capsules, tabletting, microencapsulation, blood plasma extenders as well as medical research papers. Various food applications were described including the interactions of gelatin with other food polymers. Gelatin is used in diverse applications such as ceramics manufacture and tissue engineering. Interestingly, gelatin can be synthesized by recombinant technology with the main use apparently for high value pharmaceuticals. Analysis techniques discussed included molecular weight distributions, gelatin setting characteristics, and odour analysis. The BSE risk for gelatin was discussed with the results of extensive research confirming that gelatin is safe and never had been a BSE risk. There were a few papers on photographic applications. Dr Tani gave an excellent review of the use of gelatin in emulsion technology and a further paper comparing digital and analogue photography. Gelatin in inkjet papers was discussed by Prof Shpolsky. Other papers included improvements in trace metals analysis, a review of crosslinking, and a discussion of aldehydes in gelatin. 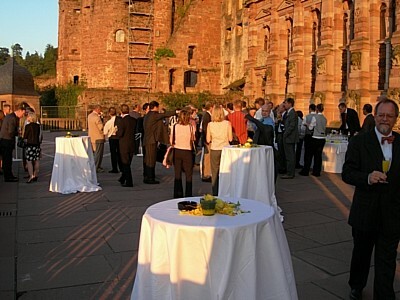 The highlight of the social program was the conference dinner which was held in the magnificent Heidelberg castle. The reception was in the courtyard overlooking the river Neckar followed by dinner in the castle cellars alongside the famous (and enormous) wine barrel still guarded by the ever-thirsty court jester, Perkeo. Sadly, the barrel was emptied long before our arrival! This was a most enjoyable conference and we look forward to the next one which is anticipated in 3-4 years time. For further details about the IAGS, please see the website http://www.iagsociety.com.